Summer and shish kabobs go hand in hand! I love homemade fajitas, and created this grill friendly recipe that makes fajitas perfect for summertime. 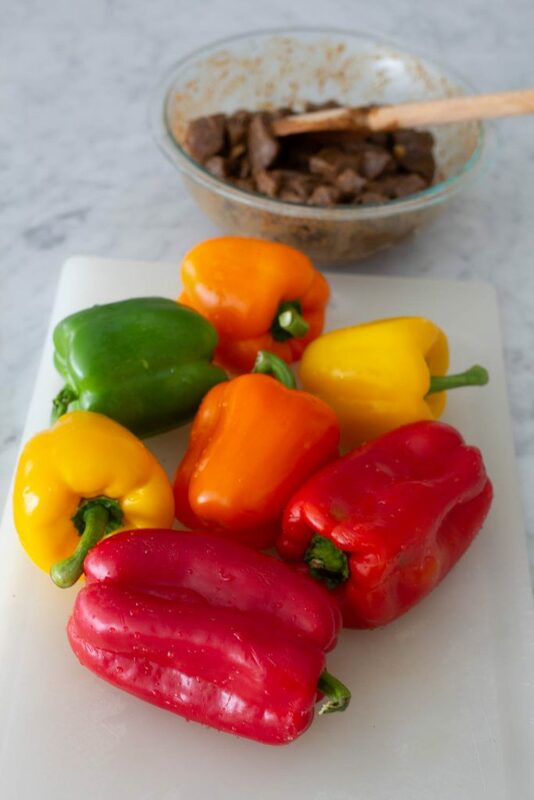 Beef Fajita Shish Kabobs combine a few of our favorite seasonings, meat and veggies to make this dish delicious and colorful! There are few dishes that are easier to prepare than traditional fajitas. 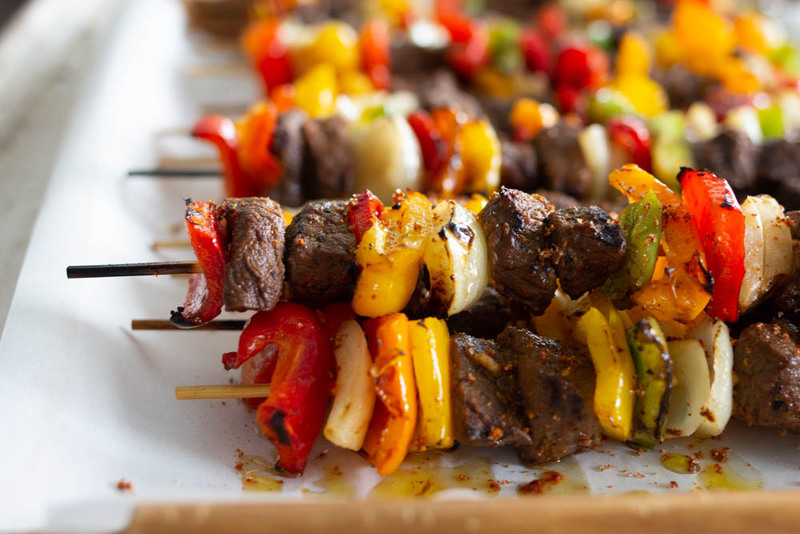 Beef Fajita Shish Kabobs are so simple, and grill friendly! I posted our favorite recipe for Lemon Pepper Chicken Shish Kabobs with Soda Pop Marinade a couple of years back, which was met with great reviews. We always have an abundance of wild game in our freezer (because Grant is a bowhunter) so one of the challenges I face in the kitchen is how to cook wild game without drying it out! This marinade and quick-cook method on the grill is one of our favorite ways to enjoy big game meat. Beef Fajita Shish Kabobs work well with most tender cuts of wild game (tenderloin or back strap) as well as beef. I suggest Filet Mignon or Tenderloin when using beef, but have also had success grilling shish kabobs with Tip Sirloin, which is a less expensive. The key with all wild game (and beef) is to not overcook! As I’ve said in other posts, my kids frequently requested shish kabobs when they were young. 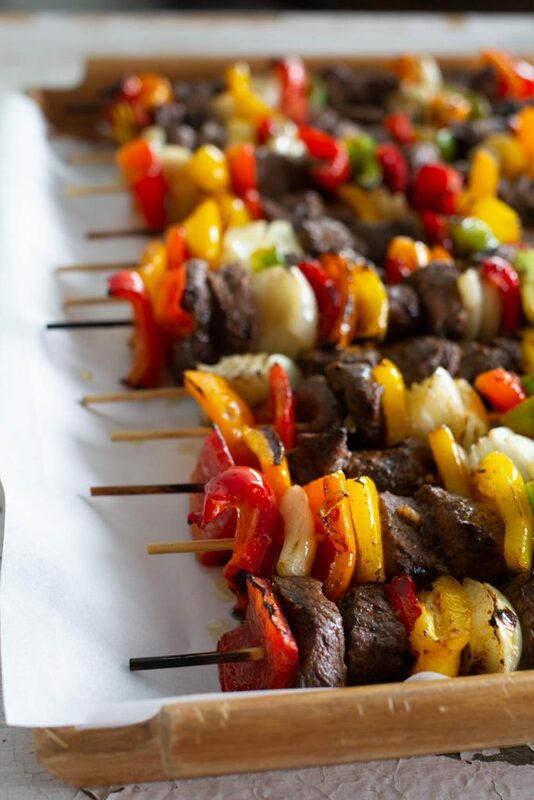 There’s something festive about shish kabobs that kids love! Maybe it’s the word SHISH?! If you are in a hurry and want to make this dinner and skip the threading of meat onto skewers, I suggest marinating the meat and then cooking the steaks and grilling the veggies whole. When everything is cooked, just remove from grill and slice up. Place on a big platter and serve with some warmed tortillas! How easy is that? 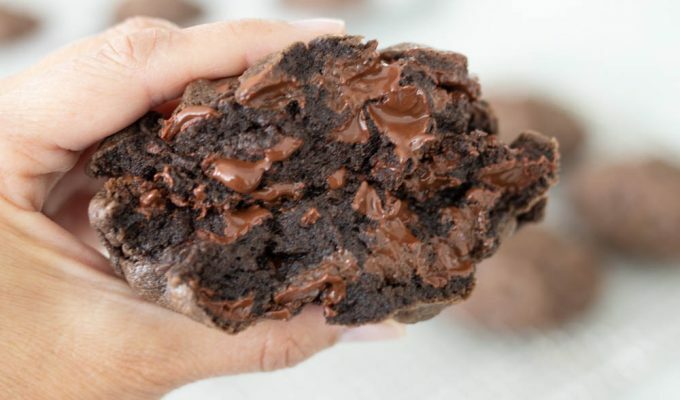 If you are reading this recipe and thinking shoot! I don’t have time to marinate this for a day, no worries. Just mix the marinade together and let sit for a few minutes. It won’t have quite the same effect as a long marinade overnight or for a few hours, but you’ll still have a pretty tasty dish on your hands in just a few minutes. We like to serve this with rice – any type will do. I love Instant Pot Brown Rice, or plain white rice. Our favorite is the rice that was inspired by Cafe Rio! 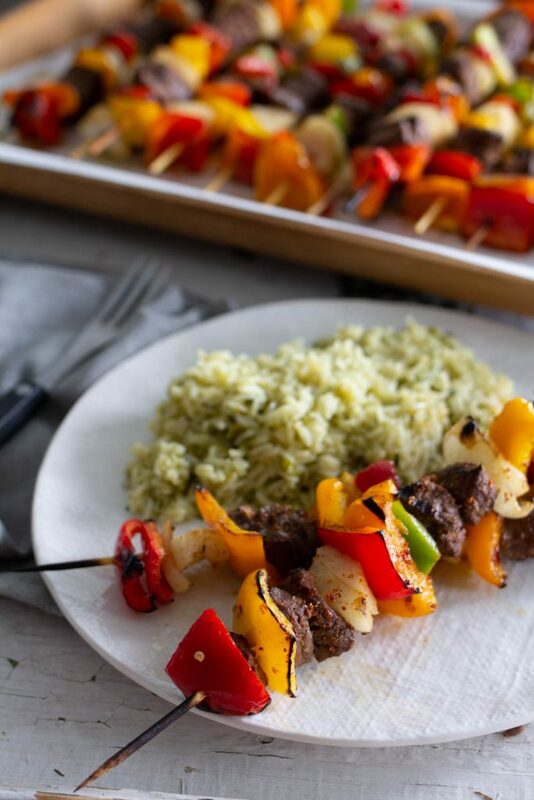 ABK’s recipe for Cilantro Lime Rice is so simple and the perfect side with Beef Fajita Shish Kabobs. Hope you love this twist on everyone’s favorite fajita dish and get out enjoy the grill this summer! Cut the meat into 1 1/2 inch chunks and combine the meat and marinade ingredients in a shallow container with lid or a gallon size Ziplock bag. Marinate the meat for 2-24 hours in refrigerator. Also, if using wood skewers, soak in a 9x13 pan with a little water so they won't burn while cooking. Cut up the vegetables in large chunks, about 1-1 1/2 inch squares. Toss veggies in a large bowl with 2 teaspoons Trader Joes Chili Lime Seasoning or 1/2 teaspoon salt and 1 teaspoon chili powder and 2 tablespoons olive oil. Set aside. When ready to assemble the shish kabobs, drain the meat from the marinade and discard. 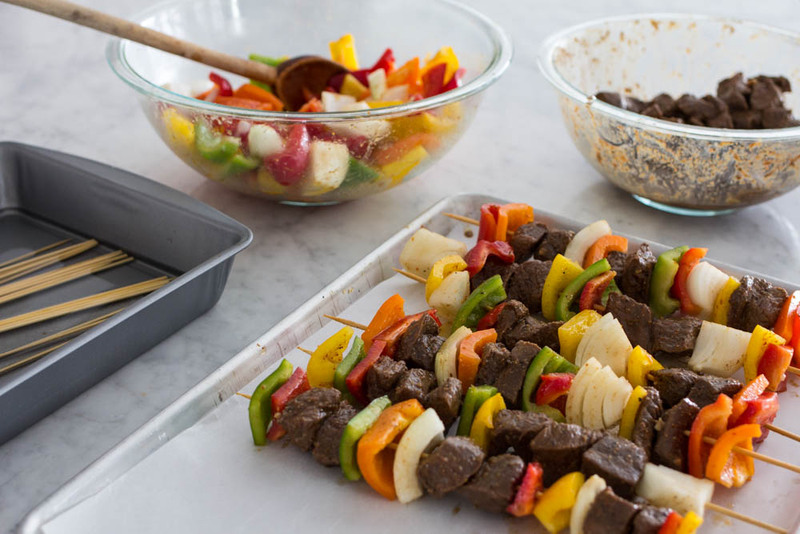 Thread the marinated meat and veggies on the skewers, allowing for shrinkage of both while grilling. Turn the grill to medium-high heat or, on a temperature controlled grill to 400 degrees. Cook the prepared shish kabobs for about 3-4 minutes per side, turning once for medium doneness. Remove from heat and serve immediately or wrap in foil to keep warm until ready to serve. Metal skewers can be found at most kitchen specialty stores or online. They may be used over again. Wood skewers are found in most grocery stores. Make sure to purchase skewers that are sturdy enough to hold the meat and veggies on the stick while grilling. Soaking wood skewers for an hour in cold water will help keep the wood from scorching. Trader Joe's Chili Lime Seasoning is a mixture of salt, chili powder and dried lime. The substitution for this seasoning is found in the recipe and simple to make. The amount of cook time will vary according to the type of meat used, the size of the meat and veggie pieces. If you like your veggies especially soft, place the peppers and onions on a plate and microwave for about a minute 30 seconds before threading on skewers. If you don't have access to a grill, this dish may be cooked in an oven under the broiler. Set the rack on the second to top in the oven and broil on high for about 3 minutes per side, turning once.